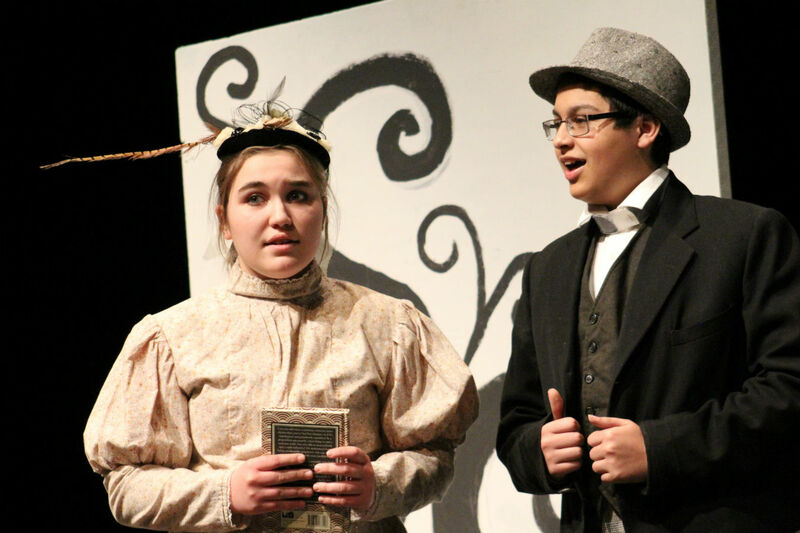 The Cannon Falls Theatre Department recently performed this year’s one act play, “The Importance of Being Earnest”. Instead of one certain character being named Earnest, the plot of this story circulates around a name: Earnest. This name is adored by two fair maidens, Cecily and Gwendolyn, whom two young gentlemen, Jack and Algernon, wish to marry. In order for the women to be interested however, the men’s names need to both be Earnest, because from the women’s view, “There is something in that name that inspires confidence”. So the story goes on as both of these men have to keep up the act of being “Earnest”. From the audience’s point of view, the story was very confusing, especially in the first scene, since the relations and family connections were so intertwined. Not only was everyone related and wanting to be married, but Jack and Algernon were both claiming their names were Earnest at different parts of the one act making the story even more complicated. Throughout scene one, introductions were made between the mighty and high status lady Bracknell with her daughter Gwendolyn and Jack and Algernon, Gwendolyn’s cousin. While Jack, pretending to be Earnest, tries to win Gwendolyn’s hand in marriage, Algernon starts to take an interest in Cecily, Jack’s ward, which is a big part of scene two. Against Jack’s wishes, Algernon decides to visit Jack’s manor claiming to be Jack’s brother in order to meet cecily. This in turn causes Algernon to pretend to be named Earnest because that is the name that Cecily finds inspiring. While this shenanigan is taking place, Jack is in ‘despair’ over his brother Earnest who “died of a chill in Paris” even though he never actually had a brother. Through all of these confusing twists, the two men eventually dig themselves into a deeper hole which is revealed in scene three. Two engagements and one scene later, the truth is revealed as Gwendolyn and Cecily converse for the first time, claiming to both be engaged to a man named Earnest. This is the final push which uncovers that neither men were named Earnest. However, with the reappearance of Lady Bracknell, she notices something peculiar about Jack’s maid and we soon find out that Jack is the long lost family member and also Algernon’s brother who was lost as a baby.